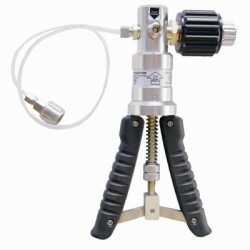 Pneumatic hand pump for applying test and calibration pressures with precision from -0.96 up to 40 bar gauge. Special Options: Pressure connection adaptor kit with 1/8, 3/8 and 1/2 inch bsp female plus 1/2 BSP male test point gauge fitting. 1/8, 1/4, 3/8 and 1/2 NPT female fittings. 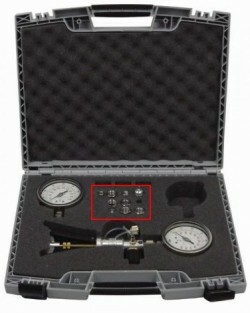 Robust plastic transporting case with foam cutaway inserts and comparator analog dial or digital test gauges. The PGS40 mid pressure handpump can be used in conjunction with a precision pressure gauge or indicator for pressure testing or calibrating pressure gauges, pressure sensors, pressure switches and pressure indicators. A volume adjuster is incorporated into the PGS-40 mid range pneumatic hand-pump for fine adjustment of calibration pressure setpoints. In order to protect the instrument under test and the reference pressure standard from accidental over-pressure the PGS 40 mid range calibration pump includes handles with built-in stroke adjustment to limit the travel of the pump action. The PGS40 handheld pressure generation system includes 1 metre length flexible hose with 1/4 BSP female swivel pressure gauge fitting. There are also options for pressure connection adapters to convert to 1/8, 3/8 & 1/2 inch BSP female or 1/8, 1/4, 3/8 & 1/2 inch NPT and a robust transit case with foam insert for storing a pressure test gage with the handpump. Testing pressure relief valves and pressure gauges on air compressors. Test pressure gauges used on agricultural crop sprayers. The kit includes a pressure gauge for high accuracy measurement of pressures between -1 and + 40 bar, BSP & NPT test hose adapters and a rugged foam filled carrying case for protecting all components during transportation. What is the maximum volume of air that is compressed with each stroke of the PGS40 calibration hand pump? The volume of air that is compressed by one stroke of the PGS40 hand pump is 11 cu cm. The brass adapter kit is no longer available and has been replaced by the polished AIS 316 stainless steel version. All adapters are compatible with the PGS40, PGS60, PGS700 and PGS1000 calibration hand pumps. What is the purpose of the female to male thread adaptor with the part number PGS-G14I-G38A which is quoted with the PGS40 pressure calibration hand-pump? This part is used to adapt a test gauge with 1/4 BSP male pressure connection for mounting on the top of the PGS40 hand pump which has 3/8 BSP female master test gauge connection. Can the PGS40 hand pump generate a -10 psi vacuum to a transmitter for calibration? Yes it can, if the vacuum mode is selected, it is possible to generate a vacuum down to -13 psi g.
I will be testing steam safety valves with 3/8″ BSP male connections which need to be calibrated up to 3 bar. Do I screw one of the devices under test onto the end of the test hose with the appropriate BSP adaptor and generate pressure with the PGS40 scissor pump to activate/test it by simply pumping the handle? Yes, you can use this pump to test your safety valve, but try to ensure that the volume under test is as small as possible, since the pump compact and therefore is only practical for use on for small test volumes. The hand pump is quite coarse but you can easily limit the stroke for low pressures using the adjustment screw between the scissor handles. Once you are close to the relief pressure you can switch to the volume adjuster to fine tune the pressure to test the opening of the safety valve. The 3/8 BSP adaptor has a female thread so you can mount the safety valves with 3/8 BSP male threads. Can the PGS40 calibration hand pump be used for calibrating pressure transducers from -0.9 to +2 bar gauge? Yes it can, although because it is capable of generating up to 40 bar, care should be taken not to accidentally overpressure the transducer, especially if the test volume is very small with a short length of interconnecting pipework. The pump does include a stroke adjuster to limit the travel of the scissor action handles, which reduces the amount of air displaced during each pump stroke. Are the pressure gauges that come with the PGS40 pneumatic calibration test pump a mandatory part that we must be ordered together with the pump or are they just an optional part? As standard the PGS40 hand pump is supplied without any test gauges, so if you can use your own existing test gauge instead. The fitting on the top of the hand pump is a 3/8 female and a swivel adaptor to 1/2 BSP female is also supplied as standard. Other adaptors to convert the 3/8 female to a swivel 1/4 BSP female, fixed 1/4 BSP female or a fixed 1/4 NPT female, are also available upon request. We are a process and pipe work installation company and we test small systems at 3 to 6 bar g, and larger systems up 30 bar g. We have a varied range of small gauges, and we normally use a dead weight tester or send the gauges away for calibration. I have been looking on your website at the PGS 40 mid pressure calibration hand pump and would like to know if this will be suitable to calibrate our gauges against? Also how would we calibrate the PGS40? Yes the PGS40 would be suitable, which is the pneumatic pressure generation part of the calibration equipment and would be more than adequate for providing calibration pressure across your range of gauges. There are a choice of ranges for the digital test gauge that can be supplied with the PGS40 hand pump. You may find the -1 to 40 bar range with an accuracy of 0.05%FS is adequate for all your gauges, especially if your gauges are the type with a low resolution dial. If you want to improve accuracy at the lower pressures you will need additional digital test gauges with a lower pressure range, either or both the -1 to 20 or -1 to 2 bar range. It is usual for ISO9000 purposes to calibrate the master test gauge once a year, you can either send it away to a calibration service lab, or calibrate it yourself on your own dead weight tester as long as it has been calibrated and serviced at regular intervals (typically 3-5 years). What calibration tool would you suggest to calibrate 0-10 bar pressure transducer? A calibration package that includes the PGS40 pneumatic hand pump with a 20 bar ADT672 pressure calibration gauge will allow you to generate calibration set-point pressures and read pressures precisely to an accuracy of +/-10mbar. The ADT672 also has a built in DVM to read the output of the pressure transducer. Is a calibration cert included with the G10 needle dial test gauge that comes with the PGS40 calibration hand pump? A calibration certificate is not provided for these gauges as standard, since the accuracy grade of these gauges does not warrant it, and the gauges are intended for testing/checking purposes rather than high precision pressure calibration. If it is absolutely necessary to comply with your companies internal quality assurance procedures a calibration certificate can be provided upon request. I have just received delivery of the PGS40 hand pump with digital pressure gauge included and I cannot find any operation manuals or cal certs for the kit. 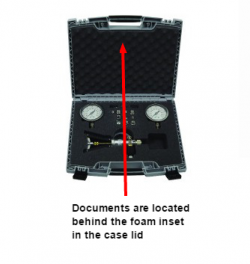 All documentation provided for the calibration pump & digital pressure gauge is inside the lid of the case behind the foam inset. Please select the options you require for the PGS40 Mid Pressure Calibration Hand Pump in your application and request a quote. Send us your enquiry for PGS40 Mid Pressure Calibration Hand Pump to get assistance with this product type.